I'm a current TruVizion customer. Can I add SetTop VU to TruVizion? SetTop VU is a separately licensed application accessed via our CentraVizion interface, so it is not part of TruVizion. However, if you currently access TruVizion through the CentraVizion interface, you can purchase SetTop VU and we will add it to CentraVizion for you. 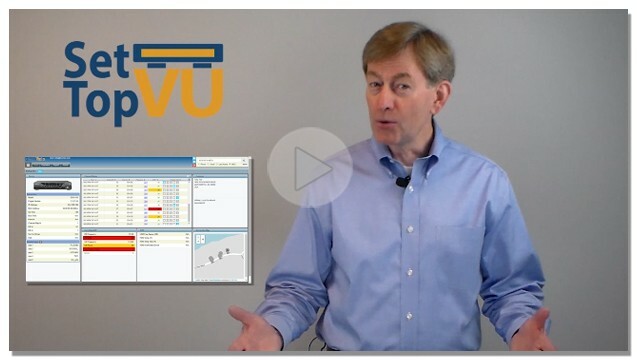 If you are still accessing TruVizion through the legacy TruVizion interface, you can purchase SetTop VU, and we will migrate TruVizion to CentraVizion as part of the process. This way you will access SetTop VU and TruVizion from the same CentraVizion interface. Can I get SetTop VU as a standalone application? Yes. SetTop VU can be licensed as a separate, standalone module within CentraVizion. Do I need to install different set-top boxes for this to work? It depends on the Set-top boxes you have. 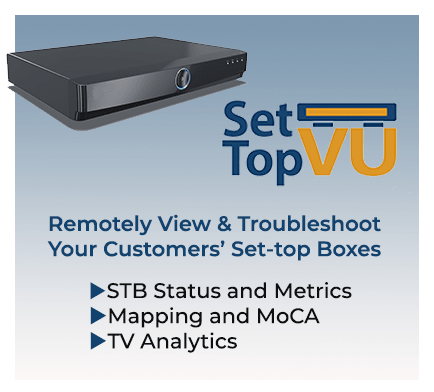 SetTop VU will work on any compatible set-top boxes that you have in your network. We may need to update firmware on the STB if it does not include the analytics collector. What set-top boxes are supported? SetTop VU supports set-top boxes from ARRIS (Motorola), Cisco, and Pace. What troubleshooting diagnostics will I see from the subscribers’ set-top box? SetTop VU can display information about the STB, such as the model and engine version, uptime, boot time, channel map ID, US ID and DS ID. It can also display the SNR at the time each channel was tuned, and parental control settings. You can also see the out-of-band downstream frequency and SNR, upstream frequency and power, lost carrier count, and errors. We can also display the installed apps, the DVR hard drive free space and hard drive temperature info. The application will also display the location of the STB on a map if we can geocode the address, which will help when comparing the status of nearby devices. What viewing information will I receive from the subscribers’ set-top box through the TV Analytics? The application tracks second-by-second viewing data and delivers that data every day for the previous day’s viewing. That data is also matched to other data sources via a privacy-preserving process. Some of the data matched includes program schedule information, demographic data, and commercial occurrence logs. How is privacy of my subscriber’s data handled in the TV Analytics? The data is fully anonymized ensuring that no personally identifiable information is ever collected or received. Like or follow us for free industry resources and for the newest updates on SetTop VU.